This Rotala is generally an easy plant to care for and is a great addition to many aquariums due to its beautiful tint of pink coloring on the leaves! 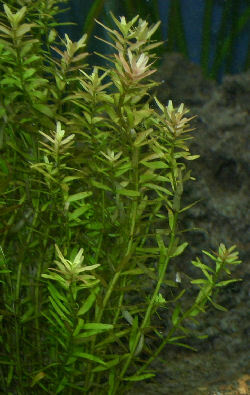 Rotala rotundifolia, also sometimes called Rotala indica has small leaves and is a good display for the background or midground of an aquarium. It grows to about 20 inches (50 cm) if cared for correctly and grows at a moderate rate. Leaf color varies from olive-green to pink and there are several different shape variations of the leaves, including oval and oblong, very narrow, or really round. The Dwarf Rotala should be kept in bright light and at its recommended temperature of 68-82° Fahrenheit to obtain its best coloring and growth rate. However it usually can adapt to lower temperatures and light levels. Propagation of this Rotala is usually fairly easy. Simply planting cuttings from the main plant usually works great. However, make sure the cuttings are least 4 inches long to ensure good growth. The water conditions should be regularly checked to help the Dwarf Rotala thrive. It needs soft water with a pH between 5 and 7.2. Make sure to perform regular water changes and fertilize regularly with a liquid fertilizer that contains iron because iron is important for healthy growth. Also provide some sort of bottom fertilization. Dwarf Rotala originate in Southeast Asia. The Dwarf Rotala propagates from cuttings that should be at least 4 inches long. This aquarium plant is readily available. this is a high light plant. 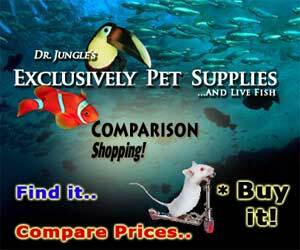 i have found that 14 hours of strong aquarium light are necessary for the plant to produce healthy growth. ideally, you want this plant to grow long, slender, rose to red colored leaves at the top. if the light requirements are not met, you will end up with scraggly grey green growth, and ultimately death of the plant. This is also a good plant for discus tanks, because it can quickly grow to the surface, giving discus a sense of security. when the stems begin to curl to stay underwater, cut off about 1/3-1/2 of the top part of the plant and replant. If there are any new shoots at the bottom of the old stem, allow them to grow out to make more plants. this plant is a fairly heavy feeder, but can do just fine in plain washed gravel, and mine even tolerates an undergravel filter. I would put in some sort of nutrient supplement. dont be scared off by the horror stories, just follow the heavy light heavy feed rule, and you should be sucessful. I disagree with Barbara's comment, I have two T5HO bulbs over a 55 gallon tank and leave my lights on 8.5 hrs daily and these plants are doing well as a result. Of course I dose Seachem's Flourish line of ferts daily and I have an iron rich substrate as well. Leaving your lights on about 14 hrs a day will do you no good and will lead to bad algae outbreaks. I understand that it needs good light and fertilization, but my worries are that some of my fishes need only not too bright light. How can I make my fish tank both beneficial to my fish and this kind of plant? I have two of these plants and I really like them, but one of them only has leaves at the top....but they both seem to be growing well.